The Balinese, though famous throughout the world for their dance, painting, and sculpture, never had the word 'art' in their own vocabulary. Likewise, the word 'artist' or 'craftsman' didn't exist in Balinese. The people who do these things are known as 'workers', just like those in the rice fields. In fact, most of these artists, even today, still work in the rice fields. Sculpture is a good example of art in Bali. It's everywhere. It's in the temples, in the hotels, in the gardens, on the houses, along the roads. Sculpture is created on public buildings, for the gods. It's considered functional, as a part of life, not as something separate. Artists are rarely identified. Much of the carving work is shared among numerous craftsmen. 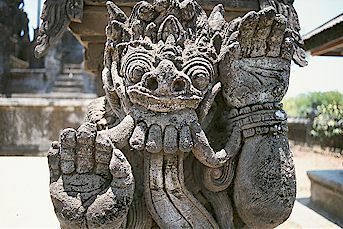 The carvings are done in volcanic rock, known as paras, which is excellent for detail, because of its' softness. Because of this softness, however, the carvings don't last long in the tropical weather. This means the sculptures must be redone every 20 or so years. Far from being a disadvantage, the result is that the art of sculpting has never had an opportunity to die. With the growth of tourism and hotels, carvings are more prolific than ever. Artists have expanded from purely religious themes, to more commercial ones, like dogs and lanterns. 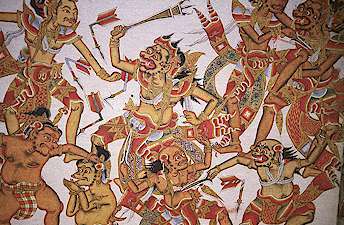 Painting is another famous art of Bali. Before the 1920, there were very few paintings that were not religious in nature. Since the advent of tourists, however, many schools of painting have developed. Hindu themes are still popular, as are scenes of nature and village life. Ubud and its' neighboring villages, Peliatan and Penestanan, are well-known for their concentration of artists. Balinese carving and painting skills are also applied to wood. Statues, furniture, ornamentation, and masks are seen everywhere in Bali. 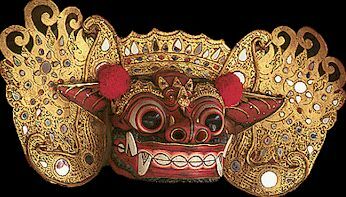 In particular, the masks of Bali have become world famous. Many Balinese dances require masks, such as this Barong, carved from wood, then painted and decorated. The Balinese have never bothered to compartmentalize their lives. Art, then, is not something that is hung on a wall or put in a cabinet. Art is always functional, and the functional is always art. Offerings, cloth, and architecture fit in this mode of thinking, as well. It's difficult to find any phase of Balinese life that could not, by western standards, be called 'art'. This offering to the gods, for example. Or the sculpted rice fields of rural Bali. While created for the utility of irrigation, there is no denying the beauty of the result. Beauty and function, in all phases of life, are one.